If there’s one thing director Goldfarb is specialized in, it’s making incredibly fascinating short movies. Ian is certainly not any different. 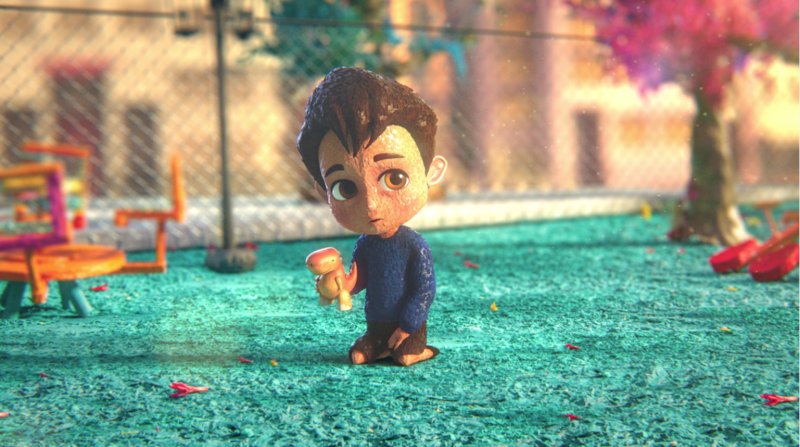 This time it’s a wonderful animation film based on tragic real-life events. Ian, a young boy, seems just like any other kid of his age. Playful, full of energy and totally ready to discover the world with his friends. However, life is turning out to be relentless towards little Ian. One day, he’s starting to develop symptoms of Parkinson’s disease. Starting to shake his arms uncontrollably and spilling his drinks, kids are making fun out of him. Not long after that, he becomes wheelchair bound and seeing his friends playing without him is breaking his heart. As if things couldn’t get any worse, he’s also feeling the consequences of what a paralysis could be. Ian and his mom are both at their wit’s end and don’t know what to do. Ian’s lust for life has turned into sadness, angriness, and melancholy. Will he be able to find the passion for living again or will the heartache take over completely? Whoever thought the only actors and actresses can make you feel sad, angry or becoming emotional, should think again. Goldfarb and his team created an incredibly touching movie in which Ian is beautifully created. We laugh when he laughs, we’re sad when he’s sad and we’re hopeful when he finds a sparkle of hope. It’s all thanks to the wonderful animation that makes the young boy really looks like one of us. Especially with the very piercing eyes and refreshing facial expressions. During the film, you might forget that it’s based on real-life events but at the end of the film, you see who the real Ian was. You don’t only realise that someone had to go through all these unfortunate times but that the makers of this short film did an impeccable job in creating the animation. It’s the animations that make Ian an incredibly compelling movie, it’s also the immersive music. Joyful, optimistic and cheerful at one time. Dark, sombre and melancholic at another. Together with the images, it draws us to the screen from start to finish. It is not at all surprising that the film and its director won multiple awards all over the world such as the Best Animation during the Delhi Shorts International Film Festival and the same one at the L.A. Shorts Fest, both this year. Life can give some setbacks once in a while but thanks to this beautiful short film, it will become better instantly. Not only because of the fact that the story that will make you realize that your life isn’t as bad as you think but it’s also the colourful, fabulous, lively and bright animations.